Soy components such as folate, protein, calcium, and fiber may be responsible for health benefits reported in the study. (Health.com) -- Women with breast cancer who eat more soy are less likely to die or have a recurrence of cancer than women who eat few or no soy products, according to a new study. 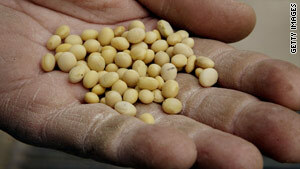 In the past, physicians have often warned breast cancer patients not to eat soy. The new research represents "a complete turnaround" from the previous understanding about the link between soy consumption and breast cancer, says Sally Scroggs, a registered dietician and senior health education specialist at M.D. Anderson's Cancer Prevention Center in Houston, Texas. The study looked at more than 5,000 women in China who had undergone a mastectomy; they were followed for about four years. The women who consumed the most soy protein (about 15 grams or more a day) had a 29 percent lower risk of dying and a 32 percent decreased risk of breast cancer recurrence compared to the women who consumed less than about 5 grams of soy protein a day, according to the study, which appears in the December 9 issue of the Journal of the American Medical Association. The National Cancer Institute and the U.S. Department of Defense's Breast Cancer Research Program funded the study. Soy foods--such as milk, tofu, and edamame--are rich in naturally occurring estrogens (especially isoflavones) that can mimic the effects of estrogen in the female body. Because the most common types of breast cancer depend on estrogen to grow, experts once feared that soy isoflavones could stimulate the estrogen receptors in breast-cancer cells, even though the estrogens in soy are much weaker than those produced by the body. "Soy isoflavones may compete with estrogens produced by the body. Soy isoflavones may also reduce the body's production of estrogen, and increase clearance of these hormones from the circulation--all of which together reduce the overall amount of estrogen in the body," says the lead author of the study, Dr. Xiao Ou Shu, M.D., Ph.D., a cancer epidemiologist at the Vanderbilt-Ingram Cancer Center of Vanderbilt University Medical Center in Nashville, Tennessee. Shu says, however, that factors beyond estrogen may be at work. Other components of soy foods, such as folate, protein, calcium, or fiber (or some combination thereof) may also be responsible for the health benefits reported in the study, she says. The new findings, which seem to contradict what many women have heard from their doctors over the years, could prove perplexing for women such as Andrea Mulrain, 44, a former music executive who was first diagnosed with breast cancer 10 years ago. Despite the study's findings, the final verdict on soy and breast-cancer recurrence is not yet in, according to an accompanying editorial written by Dr. Rachel Ballard-Barbash, M.D., of the National Cancer Institute in Bethesda, Maryland, and Marian L. Neuhouser, Ph.D., of the Fred Hutchinson Cancer Research Center in Seattle, Washington. Health.com: Breast cancer -- What should I do if I'm high risk?